Maintenance is what keeps your lawn looking its best. Each step is designed to counterbalance unfavorable conditions and keep your lawn healthy and beautiful, and keeping to a lawn schedule makes it easy to keep on top of your lawn's needs. Applying fertilizer to your lawn is a great way to make sure your lawn is healthy and beautiful. In this video we give you a few general tips on how to apply granule fertilizers to your lawn. Fertilizer is key to giving your lawn the proper nutrients it needs to thrive. Proper fertilization is a balance between relying on what your soil is giving your lawn, and what you can add. To apply fertilizer, use a broadcast spreader that has a wide spread. Use a consistent fast walk to make sure that the fertilizer does in fact spread out wide. Come in from the sidewalk or drive way about two feet to create a perimeter. Now start walking the lawn. With every pass, make sure to come out about two feet from your last pass, so the fertilizer throws back to your tire marks. 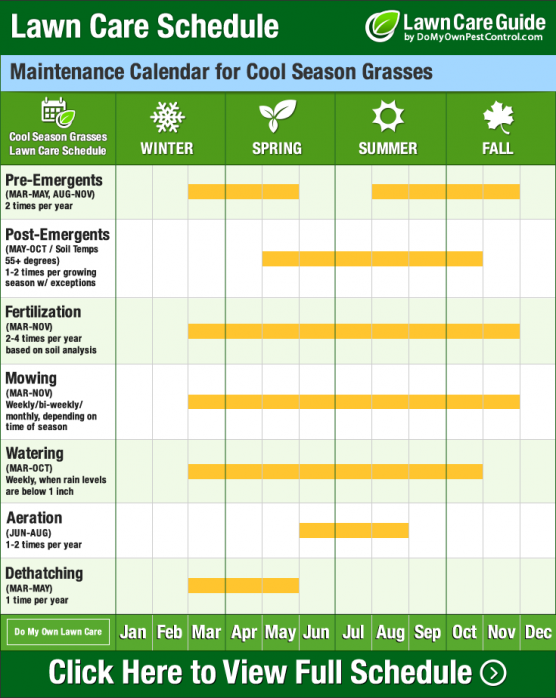 Generally, with cool season grass, fertilizing should be done March through May and September through November. For warm season grass, fertilizing should be done March through November. Specific fertilizer and how much you will put down, will depend on your grass type, where you live, climate and other contributing factors. Over fertilizing can cause spurts of random growth that will cause unsightly, uneven patches of grass. However, under-fertilizing will make it hard for the grass to fight off invading weeds and disease. And it’s that easy with the expert help from Do My Own Pest Control dot com! Subscribe to our channel for more DIY and product videos! Fertilization is key to giving your lawn the proper nutrients it needs to thrive. Proper fertilization is a balance between relying on what your soil is giving your lawn and what you can add. Over-fertilization can cause spurts of random growth that will cause unsightly, uneven patches of grass. However, under-fertilization can cause the grass to have difficulty warding off invading weeds and disease. We recommend using a soil analysis test kit or taking a sample of your soil to your local cooperative extension so your soil can be analyzed to determine what nutrients your soil is lacking. The healthiest, hardiest lawns are fertilized 4 times per year, fall, summer, early spring and late spring. When fertilizing in the spring you can choose to use a "weed and feed." These products contain both a fertilizer and a pre-emergent herbicide. Cutting your lawn seems like an easy task, but there is more to it than some might think. Proper mowing height, frequency and pattern all play a part in how well your lawn looks and how healthy it is. In this video we will go over some basic lawn mowing tips. Proper mowing height and frequency plays a big role in your lawn’s overall health. Mowing height can affect many aspects of your lawn. Too close and short can mean you will have to mow more often to keep it healthy, and can make your grass susceptible to diseases. If the weather is hot and dry, you'll want to increase your mowing height to avoid cutting the grass too short as well. If cut too short under hot and dry conditions, the grass could burn, causing the lawn to die. Choose a medium height setting for best results. If the grass is long or wet, use a bag so clippings won't cover up any new seed that has been put down. This will also cut down on the risk of having to deal with a thicker thatch later. Leaving grass clippings on the lawn can add extra nutrients. Make sure that the clippings are mulched really fine so clumping won't occur. Change your mowing patterns every week so that ruts will not form from your mower's wheels, and overlap just a bit with each pass you take. And it’s that easy with the expert help from Do My Own Pest Control dot com! Subscribe to our channel for more DIY and product videos! Proper mowing height and frequency plays a big role in your lawn's overall health. Mowing height can affect many aspects of your lawn. Cutting grass too close and short can increase your maintenance load (it will have to be cut more often to keep it healthy), and can make your grass susceptible to diseases. Increase mowing height during hot and dry weather. A good rule of thumb is to never remove more than 1/3 of the length of the grass blades at a time. Most grass types are the most healthy when they are are between 2-3 inches in length. Your lawn should be mowed consistently, but when applying fertilizers, pre-emergent pesticides, or insecticide applications to your lawn, read labels carefully since some have mowing restrictions before application, and some have mowing restrictions after application. During spring you may need to mow as often as once per week. During summer mowing is less frequent and usually once every 2 weeks is sufficient. Finally during fall as the temperatures start to drop you may need to mow once a month until the grass starts to go into a dormant stage and mowing will cease. This typically happens once temperatures start consistently reaching 50-55 F for about 1 week. Most people think watering your lawn is simply putting a sprinkler in the yard and letting it run large amounts of time. In this video we go over some basic lawn watering tips to make sure your yard is as healthy as possible! How often you water your lawn depends largely on where you live and your specific grass type. Proper watering is important, but will not fix all of your lawn’s issues. The main reason to water grass in summer is to maintain color. Lawns need between one to one and a half inches of water a week. Do not water a whole inch in one day. Instead, do a half inch of water, twice a week. Your soil needs time to dry out between irrigation cycles. To measure this, simply buy a rain gauge and place it in the middle of the stream, and run your sprinkler for about 45 minutes to an hour. Make sure to move the sprinkler around to cover all of the yard, making sure to barely overlap in areas. The best times to water your lawn is early in the morning or late in the evening. Proper grass height and weather conditions affect how much water your lawn needs. If drought conditions exist, water just enough until there is runoff. Once run off exists, stop your watering, to conserve water. Signs your lawn needs water are brown, gray or even white spots. You can also perform a walk test. Simply walk across the lawn and watch your footprints. If they do not spring back up, the grass is dehydrated and needs water. And it’s that easy with the expert help from Do My Own Pest Control dot com! Subscribe to our channel for more DIY and product videos! How often you water your lawn depends largely on where you live and your specific grass type. The main reason to water grass in summer is to maintain color. Proper watering is important, but will not fix all your lawn's issues. Deep, infrequent waterings help to encourage deep root growth. Shallow, frequent waterings lead to shallow root growth and weak roots. Water in the early morning to avoid scorching and to make sure the blades are dry before the humidity sets to prevent lawn diseases. If you get less than 1" of precipitation in a week it is time to consider watering your lawn. It is not recommended that you water more than 1" of water per watering. Aerating your yard is one of the most important things you can do. By pulling cores of earth from the lawn, you are allowing much needed nutrients to get down to the soil level where they belong. The results are a greener and healthy lawn. Compacted soils can stop air, water, and nutrients from getting where they need to go. When left unchecked, the lawn can start to become dry and die, leaving behind hard dirt patches. Core aeration is the best solution to fixing this problem. You can rent an aeration machine for larger lawns or use a hand corer, like a garden fork, for smaller areas. WIth a machine, make passes just like you would with a lawn mower. Go back and forth over the whole lawn. Then cross the paths you just made, going back and forth, creating a checkerboard type pattern. The more holes in your yard the better. If aerating by hand, simply take the hand corer or garden fork, and work it into the ground. Make swivel motions while pressing down. Cores of earth are removed to allow the lawn to breath, gain water and receive nutrients. This will allow for water and nutrients to get to the roots of the grass, allowing for a stronger, greener lawn.The cores are left on your lawn for extra nutrients. Eventually the holes will be filled in with new grass. And it’s that easy with the expert help from Do My Own Pest Control dot com! Subscribe to our channel for more DIY and product videos! Compacted soils, due to silt or clay soils or heavy foot traffic, can inhibit growth since air, water, and nutrients are unable to reach the roots. When left unchecked, compacted soils can lead to pest and maintenance problems, including making it harder for grass to fight off weeds and recover from damage. Core aeration is the best way to go here, and you can rent an aeration machine for larger lawns and a hand corer for smaller areas. Cores of earth are removed (and left on your lawn for extra nutrients) and holes left in your lawn, which will eventually be filled in with new grass. If you do plan to schedule an aeration for your lawn it is important that any pre-emergent herbicide be applied after the aeration is completed. Thatch is an excessive growth of grass that builds up before existing plant matter can decompose. Heavy thatch creates a barrier to air, water, and nutrients to the soil. This can cause shallow root development, prevent pesticide or fertilizer penetration, and can harbor disease causing bacteria, fungus, and insects. Dethatching generally includes power raking or using a vericutting machine to remove the excess thatch. Aeration can also accomplish a similar result. If you do plan to schedule a dethatching for your lawn it is important that any pre-emergent herbicide be applied after the dethatching is completed. Weeds distract from the color and texture of your lawn, and compete with your grass for nutrients and water. This can result in a thinned out lawn. Weeds are usually broken up into two categories – grassy (which includes crabgrass) and broadleaf (like dandelions and clover). You can control almost all turf weeds with either pre or post-emergent weed control products. Pre-emergent products kill weeds before they are able to grow above the soil. It is important to apply pre-emergents when the soil reaches 55 degrees, right when seeds begin to germinate in the soil. Timing is very important! You should put pre-emergents down either right before spring or right before fall. Post-emergent products kill already-growing weeds. You can choose many different types of these products based on your needs. Selective products will not harm foliage other than the target weeds, while non-selective will kill any plant it comes in contact with, including your grass. And it’s that easy with the expert help from Do My Own Pest Control dot com! Subscribe to our channel for more DIY and product videos! Weeds distract from the color and texture of your lawn, and compete with your grass for nutrients and water, which can result in a thinned out lawn. Weeds are usually broken up into two categories- grassy (which includes crabgrass) and broadleaf (like dandelions and clover). You can control almost all turf weeds with either pre-emergent or post-emergent weed control products. Pre-emergent products kill weeds before they are able to grow above the soil. It is important to apply pre-emergents just before the soil reaches 55+ degrees, just before the seeds begin to germinate in the soil. Timing is very important! Please be sure sure to refer to the product label for mowing restrictions prior to and after herbicide applications as mowing can negatively impact the efficacy of the herbicide. Post-emergent products kill already-growing weeds, and you can choose many different types of these products. Note that some will not harm foliage other than the target weed (called selective) while non-selective will kill any plant it comes in contact with, including your grass. Please be sure sure to refer to the product label for mowing restrictions prior to and after herbicide applications as mowing can negatively impact the efficacy of the herbicide. 548 of 570 people found this article informative and helpful.